You can really WOW your holiday guests by serving a few simple and tasty appetizers before sitting down to the table. Pick just one or two of these to serve as hor d’oeuvers. Keep the portion size small (bite size), so that your guests are not too full before sitting down at the table. You could also just make several of these appetizers for a cocktail party. Many of these recipes can be made in advance, which makes life a lot less hectic on the day of your party. Crostini: Macheesmo knows how to make entertaining easy and fun with their three (Guacamole, Summer Salsa, and Minted Pea) savory toppings for crispy bread that has been toasted with olive oil. Fried Ravioli: Crazy as it sounds, you can fry up ravioli for a delicious and simple starter. (Giada De Laurentiis dunks her fried ravioli into buttermilk and bread crumbs before frying). Just add a little marinara tomato sauce as a dipper and you’ve got a crowd pleaser! Cranberry pinwheels: In these festive little snacks, cranberries are mixed with feta and cream cheeses, then rolled up in flour tortillas. No cooking required. Prosciutto e melone : It sounds fancy. It looks fancy. It requires zero cooking. Make sure to ask someone at the deli counter to cut the proscuitto paper thin. Garlic Bread: If you serve garlic bread, you might have to remind guests to save room for the main course. Just like bruschetta, garlic bread is fabulously flexible in terms of what you can throw on top. You can keep it simple and stick to startcooking.com’s basic recipe, or you can dress it up with chives, some parsley flakes or oregano. This is a great way to liven up day-old bread if you’re in a pinch. Corn Fritters: Cooking for Engineers takes all the mystery out of making these fabulous fritters with their great photo-tutorial. If frying is not your thing, you can bake them instead! Deviled Eggs: This classic appetizer will always have a following. Add them to a platter of veggies and dip or cheese and crackers. Veggie Bean Chili on Chips: I don’t know about you, but if anything comes with a side of tortilla chips, I’m totally digging in! Fancy-pants Nachos: From Noble Pig, this elegant and easy, crab and shrimp version of nachos could be a meal all by itself. Cheese Platter: A grouping of interesting cheese varieties and thinly-sliced French bread or crackers makes for a great appetizer. Since it requires no cooking, you can have it ready on the table while you’re baking something else. Try a white sharp cheddar, a softer brie, and something more unusual (but readily available) like Spanish manchego. Caprese Antipasto: Get those palates ready for a great meal with a platter of tomatoes, mozzarella and basil. Drizzle with a little olive oil and balsamic and serve with a side of crusty French bread slices. You can always have thin slices of hard salami on the side, too. Jalapenos Stuffed with Sausage: Check out startcooking.com’s photo-tutorial on how to control the heat in this great recipe. Stuffed Mushrooms: These sound intimidating, but they’re really quite simple and festive. People love these at parties! . Mini Crab Cakes: Everyone loves this easy recipe made with lump crab meat. The crust, made with Parmesan cheese and panko bread crumbs and the filling can be made ahead of time and then assembled just before baking. These little treasures are also great re-heated! Sweet and Sour Meatballs: Tender and flavorful, topped with an amazingly simple sauce, these meatballs can be made ahead of time and frozen. 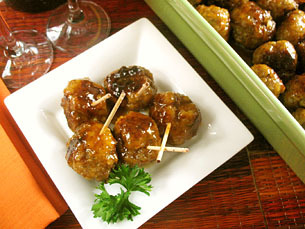 Just before your party, defrost the meatballs, add the sauce and bake them till the sauce is bubbly – delicious! Interesting – I’m going to try the fried Ravioli! If you are expecting a crowd, and are making several appetizers, make sure the flavors compliment each other-like a cheese platter with crackers and olives. I like to go heavy on the appetizers and skip a starter! “Stumbled Upon” your blog. Excellent! And I agree. More appetizers, less starters on the day that everyone eats too much anyway. Great job on the blog, I’ll be checking back often. You can check out my Thanksgiving ideas at Easy Appetizer Recipes too. Have a Thankful Holiday. Thanks Sara! 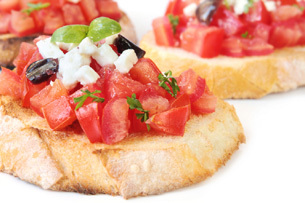 Your appetizer recipes look fantastic! Perfect for the startcooking crowd! It is amazing how delicious simple things can be! Those tortilla chips are great. I could eat them forever. 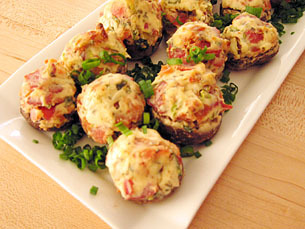 And the stuffed mushrooms are so easy to prepare and yet so tasty! All my guests love them. Anyone from St. Louis, MO, knows they are called TOASTED ravioli – and you can’t eat just 10! St Louis sounds like my kind of place! Sad ;-( looks like we can’t buy frozen raviloi in the UK! Jon! Don’t fret–as you can use the fresh ravioli for the frying recipe as well! Stumbled Upon your blog, great post. These appetizers are simple and easy to do and will be loved by all guest. Entertaining should be quick and easy but at the same time the food should be appealing and delicious! I gotta try the fried ravioli. Thanks I think I might make some of these for our guest this weekend. There are tons of easy appetizers. I really like to cook and enjoy eating and collecting appetizer recipes. Have a look at my post on How to Make Whipped Cream. I love using olives for parties or as an appetizer. I make my own simple antipasto dish with lots of olives and I’ve never had complaints. But be careful of too much garlic. I have more easy Italian recipes at my site like the antipasto. I love the fried ravioli idea.